On the eve of battle it is normal for the troops to be a little nervous, even fearful. This is especially true when they are facing a superior foe. In such times armies often look to their leaders for words of inspiration. Picture Mel Gibson’s famous, albeit wildly inaccurate, scene in Braveheart and you get my point. In the world of sport it is no different. The New Zealand All Blacks have the ‘Haka’, which is designed to strike fear into the hearts of opponents. 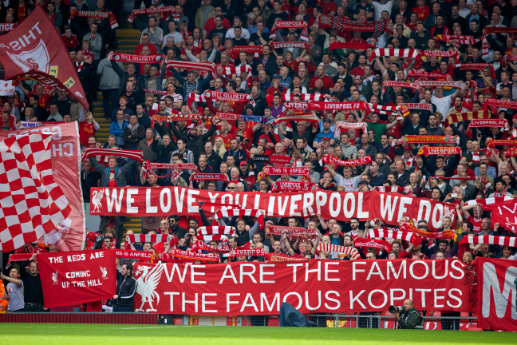 Of course we have the Kop and ‘You’ll Never Walk Alone’. As anthems go you could say it’s a multi-purpose song. We use it to inspire and lift our boys, and to strike fear into opponents. It is used in triumph and also in defeat. It’s served us pretty well down the years. Think of Olympiakos, Chelsea and Milan. These are all games where the power of our battle cry saw us triumph where we had no right to. There have been those who doubt, or even mock its power. Who can forget Marca’s famous “This is Anfield – So What” headline in 2009. I’m sure Rafa didn’t. He probably pinned it to the dressing room wall. In such games you can feel each note in your bones as every Kopite, Main Stander, Anny Roader and even those in the posh Centenary seats belts out the song with gusto. We’ll need that same power and passion on Wednesday night if we are going to get anything from the game. This is a different Real Madrid, and we are a different Liverpool to the sides that contested the 2009 battle. Yes Madrid will be without Bale, but when it comes to superstars, they have talent in abundance. In complete contrast we are a team struggling in all departments. In defence we have been a shambles, and up front we lack any sort of cutting edge. It took two own goals and a chaotic last nine minutes to see off bottom of the table QPR on Saturday. In talking to fellow Reds since that game I can really sense their fear and trepidation. On current form it is hard to see anything other than a Madrid win. I know what you are thinking, these are not inspiring words. I can’t help it; it’s just how I feel. In such moments it is us, the supporters who look to our heroes for words of comfort and, well inspiration. Cue Stevie in his post-match interview at Loftus Road. As the interviewer finished asking him about our chances in the forthcoming titanic encounter, I sat stomach in knots and eagerly awaiting his battle cry. Well Stevie that wasn’t exactly the blood curdling ‘they may take our lives, but they will never take our freedom’ cry I was looking for mate. Having said that I don’t he was aiming his comments at the supporters at home. After all, our performance on Wednesday night is not in doubt, is it? Regardless of how poorly we have defended, or how blunt in attack we have been, and irrespective of the fact that too often this season the players just haven’t turned up, Anfield will. In our tens of thousands we will bellow out that famous old song, and all of the others. We will boo every time a Madrid player touches the ball, and shout our appreciation of every red tackle. I expect, no Anfield expects that everyone in that ground goes home hoarse and speechless. Stevie knows this all too well. He is after all a veteran of such battles. I suspect his words were instead aimed at the dressing room not the terrace. His tone may have been matter of fact, his words merely statements of fact, but you can bet he will be more forthright off camera, and so he should. This squad needs to understand that if they are lucky enough to be granted the awesome privilege of playing on the hallowed turf this week, they will do so not as passive tourists admiring the view. The natives will not be putting on a display for the cameras. It’s not about enjoying the spectacle, it’s frankly far more important than that. Every song we sing will be a battle cry, a call to arms and nothing short of total commitment will do. Aston Villa is gone, West Ham is but a fading memory and QPR belongs to the history books. All sins are forgiven. On Wednesday night every man in a red shirt and golden bird on his chest will be carrying the hopes and dreams of a city, and of a fan base that spans the globe. They will be given nothing short our total devotion from the first whistle to the last. This is our historic duty. Theirs is only to rise to the challenge. To be bigger, faster, stronger and sharper than they have at any time this season.